Product prices and availability are accurate as of 2019-04-02 11:57:06 EDT and are subject to change. Any price and availability information displayed on http://www.amazon.com/ at the time of purchase will apply to the purchase of this product. 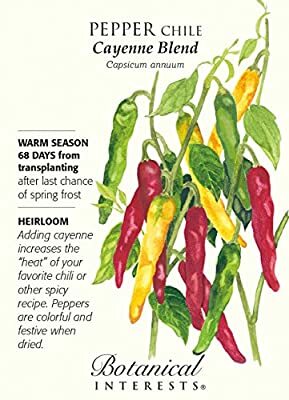 Cayenne peppers are excellent flavoring for chili and hot sauces and can be dried or ground for spice or pepper flakes (often used for pizza). You can also use them to give your salads a kick by using them to make flavored oil or vinegar. Cayenne peppers are generally hotter than a jalapeno, so they are a great addition to the garden for those of us that like a spicy condiment.